Sensual Orsino design hand crafted Tiffany table lamp in rich, warm shades of burnt amber, mahogany brown and mellow yellow tones finished with amber glass beads. 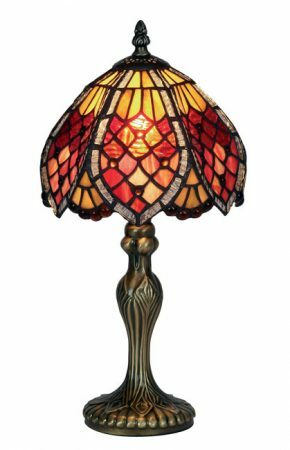 Hand made leaded glass Tiffany table lamp with an antique brass base. A beautiful hand made 200mm diameter (8 inch) Tiffany table lamp that will grace any table top. This is a petite Tiffany lamp, very suitable as a bedside lamp or on a small table. Part of the Orsino range of Tiffany lights.